Description: Round white merry-go-round with a green base and 6 seat areas for Weeble figures. Has a green spin knob in the center to spin the merry-go-round. 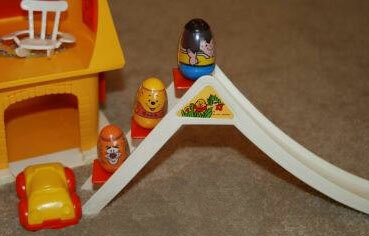 The sides of the merry-go-round have 3 triangular lithos of 3 Weebles playing hide-and-seek. Other: Bottom is marked, "©1972 Hasbro®, MADE IN U.S.A.". Description: Round white merry-go-round with a green base and 6 seat areas for Weeble figures. Has a yellow spin knob in the center to spin the merry-go-round (no lithos). Description: Round white merry-go-round with a red base and 6 seat areas for Weeble figures. Has a red spin knob in the center to spin the merry-go-round (no lithos). 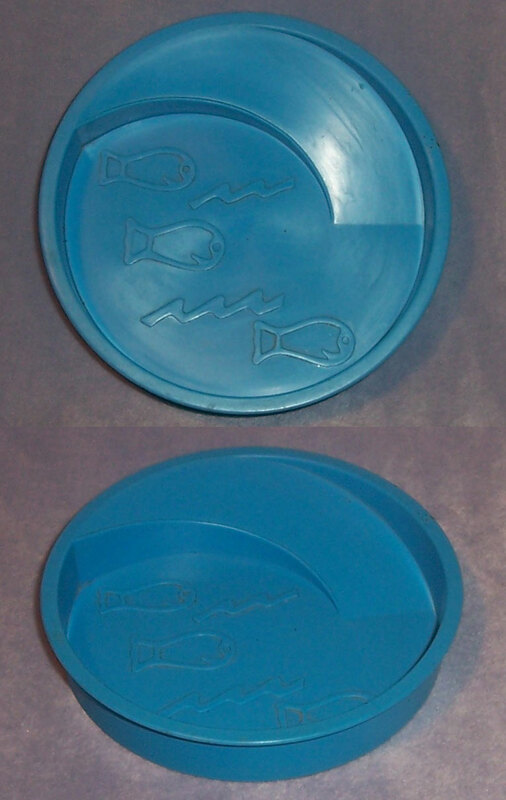 Description: Round blue kiddie pool with a molded-in slide on one side and molded fish and water wave designs on the inside bottom of the pool. Measures 4-5/8" diameter x 7/8" tall. Bottom of the pool is marked "1973 ©Hasbro®, MADE IN USA". Description: Round orange kiddie pool with a molded-in slide on one side and molded fish and water wave designs on the inside bottom of the pool. 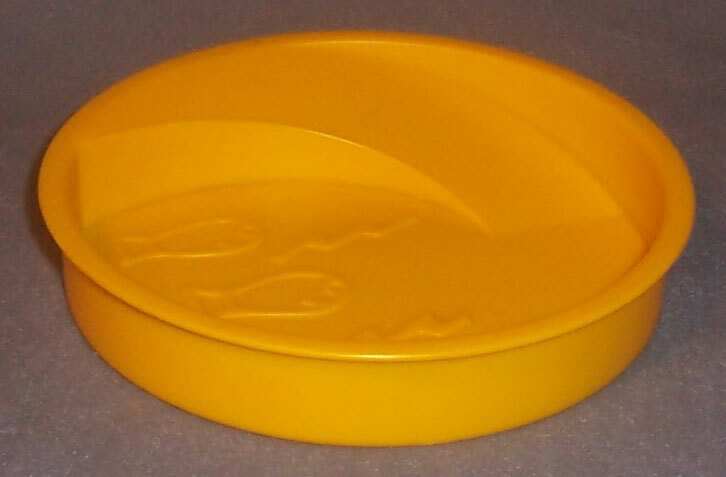 Description: Round yellow kiddie pool with a molded-in slide on one side and molded fish and water wave designs on the inside bottom of the pool. Description: Yellow rectangular wood-simulated seesaw with a recessed round area (Weeble seat) on each end and a small rectangular hole in the center (fits onto peg on the Mickey Mouse Clubhouse base to teeter). HTW319 - ORANGE long oval-shaped 4-seat teeter-totter top. One side has 4 recessed rounded seats, the center of the bottom side has 4 rounded "teeth" to balance the teeter-totter top onto the seperate base piece. Bottom is marked "MADE IN USA". 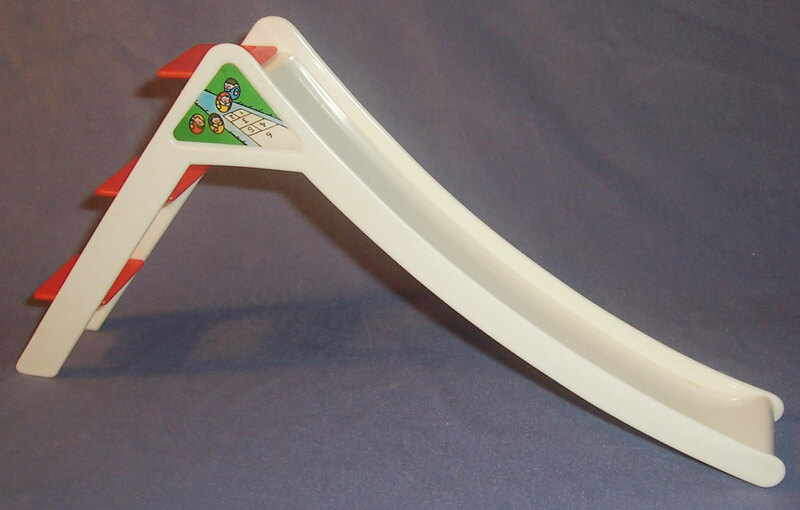 HTW320 - White triangle teeter-totter base. The two triangular sides feature an orange triangular litho of Pooh Weeble by 3 flowers. Inside is hollow and marked "MADE IN USA". 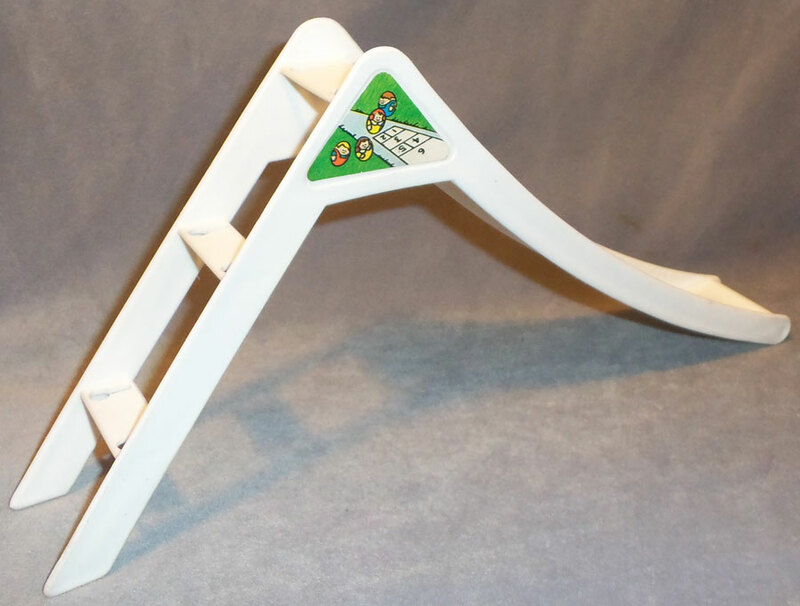 HTW153 - White triangle teeter-totter base. 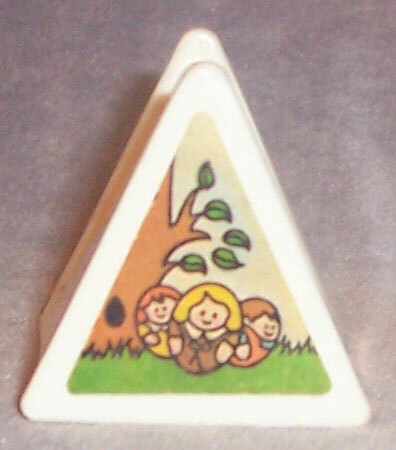 The two triangular sides feature a litho of 3 Weebles by a tree. Inside is hollow and marked "MADE IN USA". HTW159 - RED long oval-shaped 4-seat teeter-totter top. One side has 4 recessed rounded seats, the center of the bottom side has 4 rounded "teeth" to balance the teeter-totter top onto the seperate base piece. Bottom is marked "MADE IN USA". HTW404 - Yellow long oval-shaped 4-seat teeter-totter top. One side has 4 recessed rounded seats, the center of the bottom side has 4 rounded "teeth" to balance the teeter-totter top onto the seperate base piece. Bottom is marked "MADE IN USA". 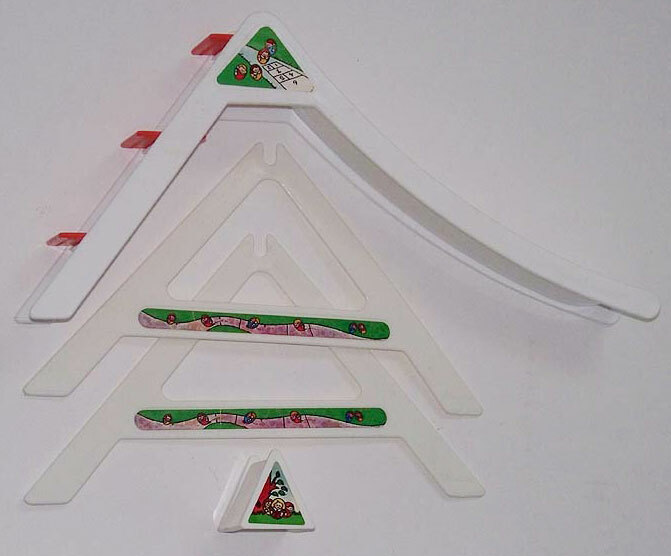 HTW405 - White triangle teeter-totter base. The two triangular sides feature a litho of Bert's face. Inside is hollow and marked "MADE IN USA". 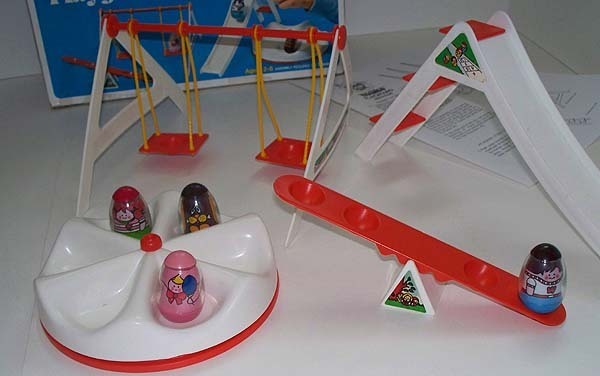 Description: Orange curved ramp with an upright stopper on each end (to prevent Tumblin Weebles from rolling off ends of ramp). The top of the ramp has an imprint marked "Tumblin Weebles". 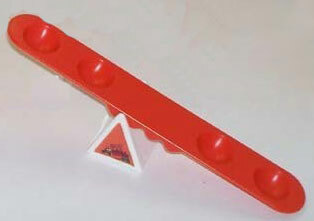 Description: Red curved ramp with an upright stopper on each end (to prevent Tumblin Weebles from rolling off ends of ramp). The top of the ramp has an imprint marked "Tumblin Weebles". Description: Yellow curved ramp with an upright stopper on each end (to prevent Tumblin Weebles from rolling off ends of ramp). The top of the ramp has an imprint marked "Tumblin Weebles". 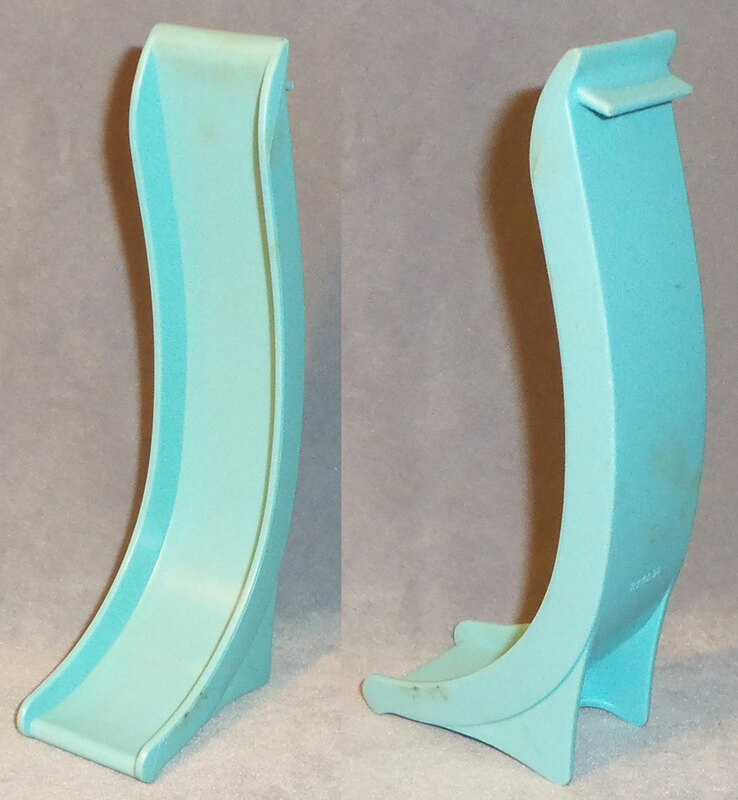 Description: Light blue 1-piece long curved slide with a triangular support arm on the back of one end, and a small rectangular tab under the back of the other end. Slide fits inside Magic Kingdom inside left half (under the yellow turret). 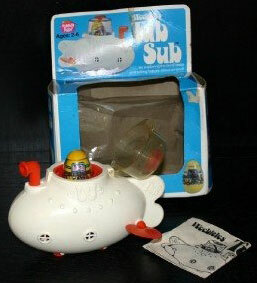 Push Weeble figure off edge of window in yellow turret for figure to slide down blue roof slide, then down to the light blue slide proped under the yellow turret. Bottom of slide is marked "143638". Measures 6-1/4" long x 1-3/8" wide x 2-1/4" deep. HTW146 - White 3-step sliding board. 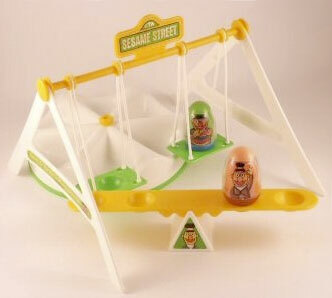 Each top side of the sliding board has a triangular litho of 4 Weebles playing hopscotch". 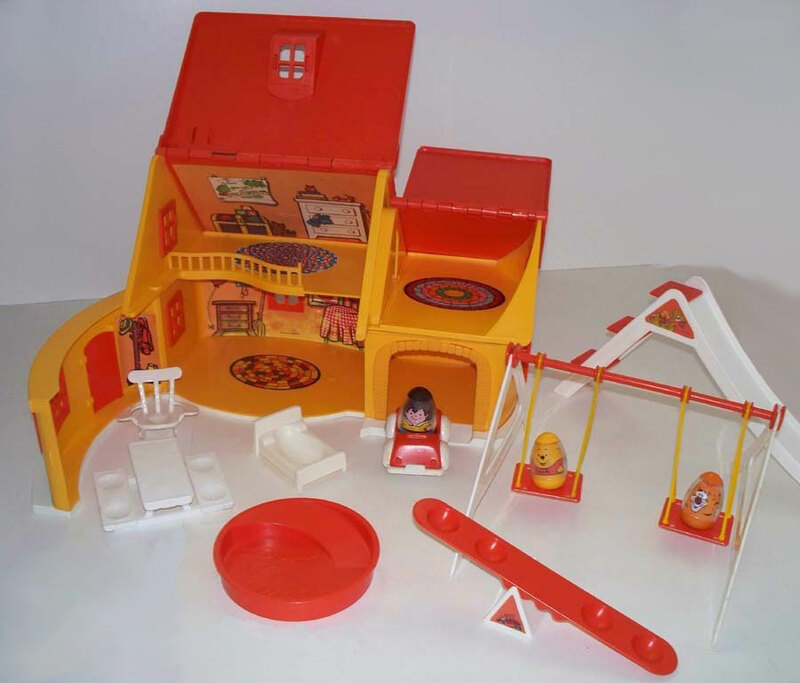 Bottom of slide is marked, "©1972 Hasbro®, MADE IN U.S.A."
3 each - HTW155 - RED "step" with 2 "knobs" on the bottom (to attach to the holes in the sliding board steps), and rounded area on top (to hold a Weeble figure in place on the sliding board step). Bottom of step is marked, "©1972 Hasbro®, MADE IN U.S.A.". 3 each - HTW315 - ORANGE "step" with 2 "knobs" on the bottom (to attach to the holes in the sliding board steps), and rounded area on top (to hold a Weeble figure in place on the sliding board step). Bottom of step is marked, "©1972 Hasbro®, MADE IN U.S.A.". HTW314 - White 3-step sliding board. 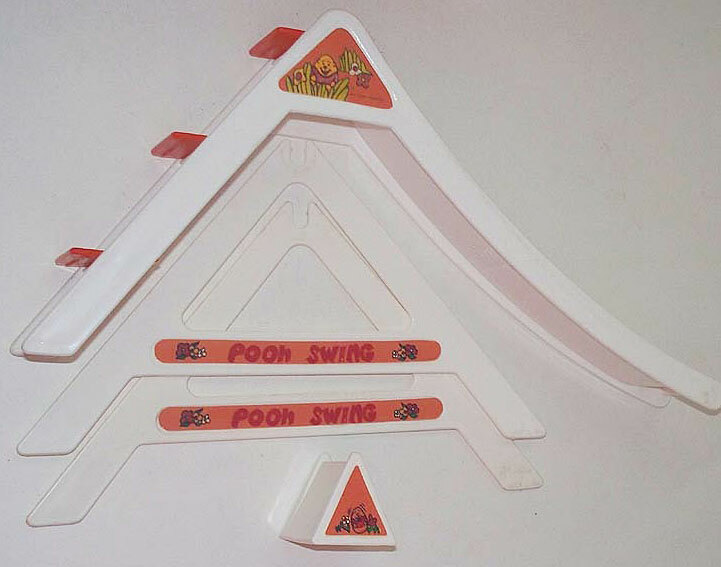 Each top side of the sliding board has an orange (or yellow) triangular litho of Pooh Weeble hiding in green grass. Bottom of slide is marked, "©1972 Hasbro®, MADE IN U.S.A."
Swing Pole - HTW259 - Small yellow wood-simulated swing "pole/beam". 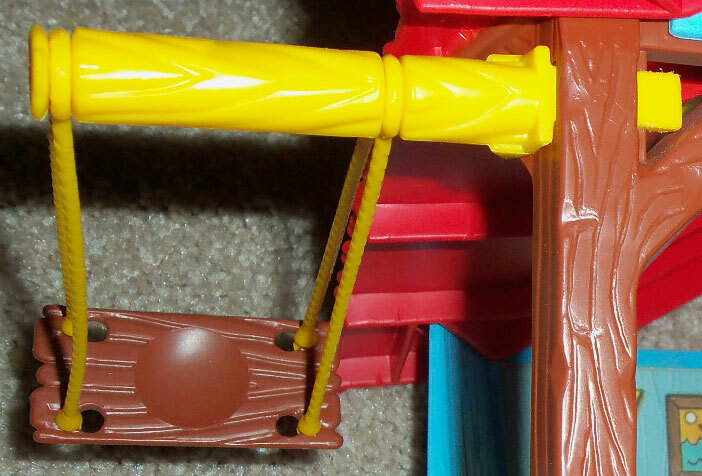 One end of the pole has a flat peg (to attach pole to the Mickey Mouse clubhouse base), and the pole has 2 rounded recessed areas (to attach swing ropes). 2 each - Swing Ropes - HTW158 - Yellow flexible swing "rope" with molded "rope" texture. The top has a loop (to fit onto the swing pole) with two 3" long "ropes" attached. 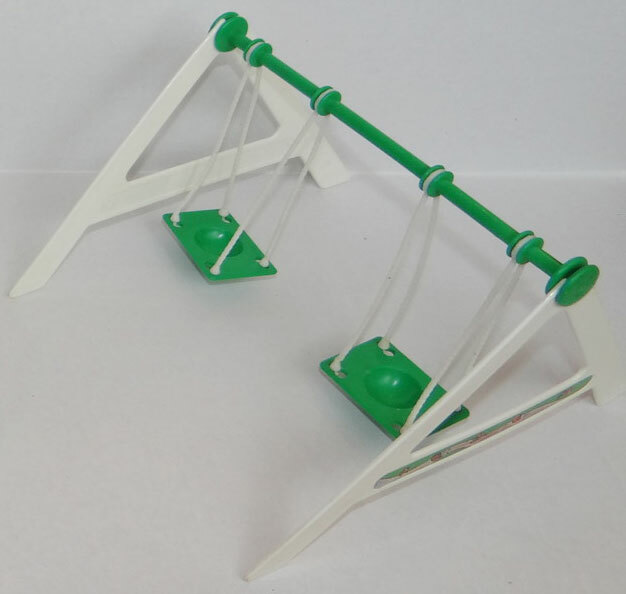 Each end of the 2 "ropes" has a triangular "peg" (to attach to the swingset seats). Swing seat - HTW260 - Brown rectangular seat with a recessed rounded "seat" in the center, and a hole in all 4 corners (to attach the swing ropes). Bottom of seat is marked "MADE IN USA". 1 each - HTW149 - GREEN swing set pole with 1 large discs on each end (to attached to the swing set A-shape supports), and 4 sets of small discs (to attach the swing ropes). The center of the pole has a handle-shaped "sign" (no litho). 1 each - HTW335 - Orange swing set pole with 1 large discs on each end (to attached to the swing set A-shape supports), and 4 sets of small discs (to attach the swing ropes). The center of the pole has a handle-shaped "sign" (no litho). 2 each - HTW318 - ORANGE rectangular seat with a recessed rounded "seat" in the center, and a hole in all 4 corners (to attach the swing ropes). Bottom of seat is marked "MADE IN USA". 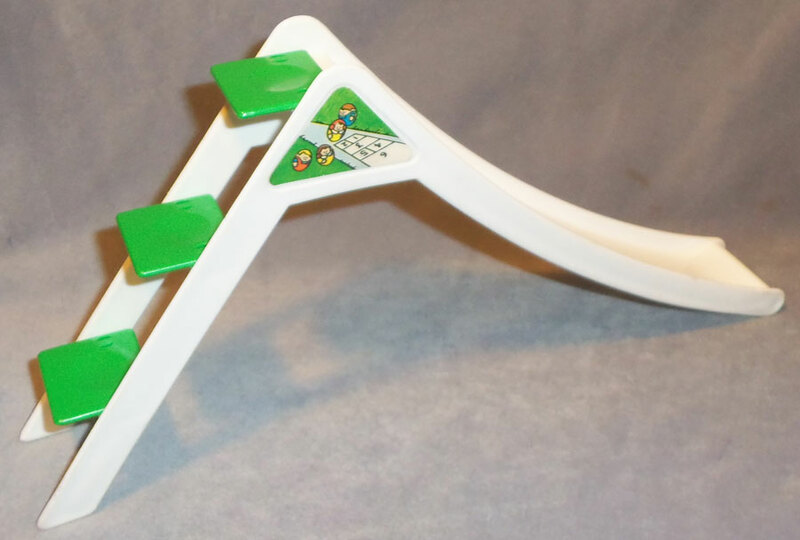 2 each - HTW316 - A-shape swing frame with a u-shape groove at the top (to support the swing pole). The middle area of the A has a wide orange litho marked "Pooh Swing". Bottom of A-shape is marked, "©1972 Hasbro®, MADE IN U.S.A.". 1 each - HTW317 - ORANGE swing set pole with 1 large discs on each end (to attached to the swing set A-shape supports), and 4 sets of small discs (to attach the swing ropes). The center of the pole has a handle-shaped "sign" (no litho). 4 each - HTW158 - YELLOW flexible swing "rope" with molded "rope" texture. The top has a loop (to fit onto the swing set pole) with two 3" long "ropes" attached. 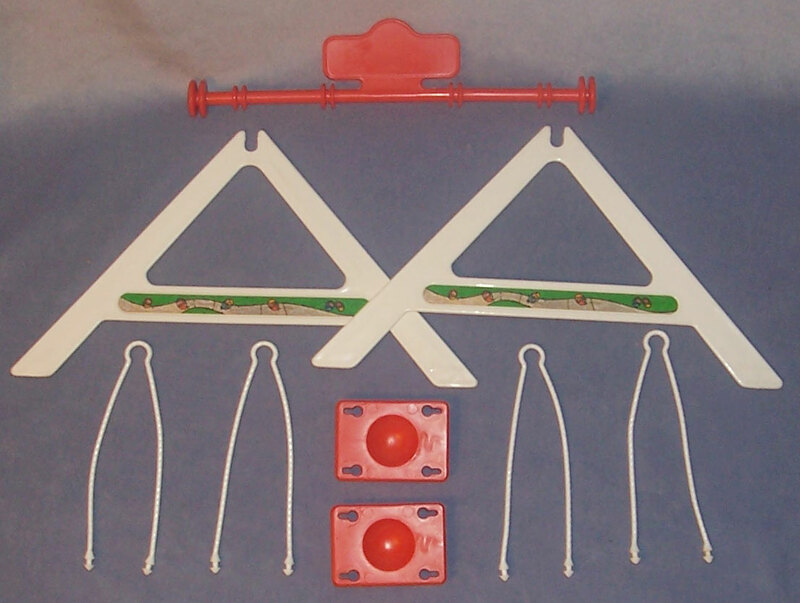 Each end of the 2 "ropes" has a triangular "peg" (to attach to the swingset seats). 2 each - HTW148 - A-shape swing frame with a u-shape groove at the top (to support the swing pole). 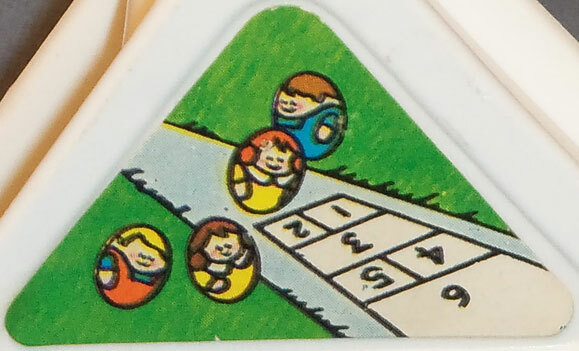 The middle area of the A has a wide litho of 6 Weebles on a sidewalk. Bottom of A-shape is marked, "©1972 Hasbro®, MADE IN U.S.A.". 1 each - HTW156 - RED swing set pole with 1 large discs on each end (to attached to the swing set A-shape supports), and 4 sets of small discs (to attach the swing ropes). The center of the pole has a handle-shaped "sign" (no litho). 2 each - HTW157 - RED rectangular seat with a recessed rounded "seat" in the center, and a hole in all 4 corners (to attach the swing ropes). Bottom of seat is marked "MADE IN USA". 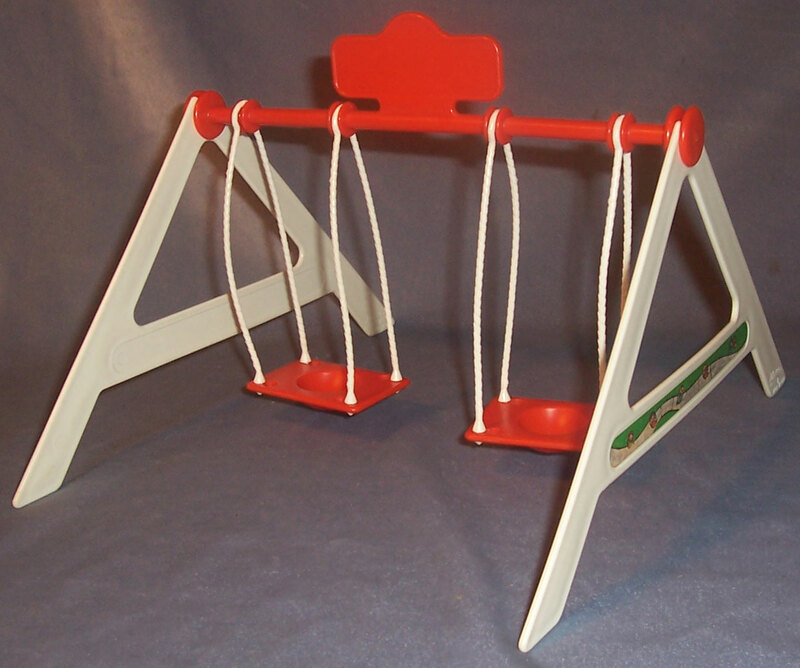 2 each - HTW402 - A-shape swing frame with a u-shape groove at the top (to support the swing pole). The middle area of the A has a wide litho of ?. 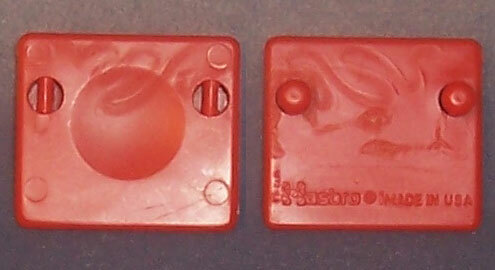 Bottom of A-shape is marked, "©1972 Hasbro®, MADE IN U.S.A.". 1 each - HTW403 - Yellow swing set pole with 1 large discs on each end (to attached to the swing set A-shape supports), and 4 sets of small discs (to attach the swing ropes). The center of the pole has a handle-shaped "sign" with a green/white Sesame Street sign litho.